That’s a universal experience, although the version in Fun Home is very specific to writer/artist Alison Bechdel, who chronicled her childhood and coming out in the extraordinary 2006 graphic memoir of the same name. Chances are good that not all of us grew up in a small Pennsylvania town with a dad who was a high school English teacher, a furniture and house restoration buff, a mortician and a closeted gay man. But that doesn’t make Bechdel’s coming to terms with her dad (and, subsequently herself) any less relatable, funny or deeply moving. What an extraordinary show to officially re-open the spectacularly renovated Curran Theatre, now in its 95th year and the ongoing project of Carole Shorenstein Hays and her family. With this one show, the Curran establishes itself as a home for the kind of forward-thinking, emotionally and artistically complex theater we need most now and will likely continue to need at an even greater level in the near future. 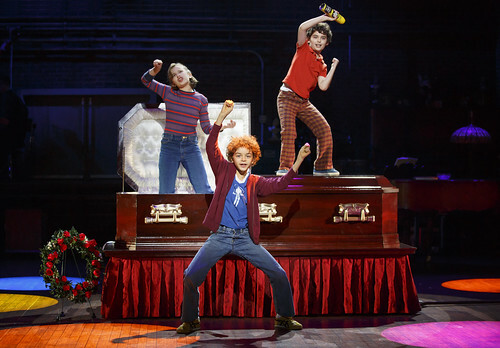 Fun Home does not seem like the kind of musical that would become a big hit, but that’s what happened in the wake of its premiere at New York’s famed Public Theater in 2013. The show, adapted by book writer and lyricist Lisa Kron and composer Jeanine Tesori and directed by Sam Gold, found a way to make the musical re-telling of Bechdel’s story feel fresh and original while never losing sight of the fact that Bechdel is telling her story from a cartoonist’s point of view. In many ways, the show is about a woman creating her memoir. To do that successfully requires the author to dig deep and try and face the truth. For Bechdel, that means containing her dad, mom and two brothers within cartoon panels with balloon dialogue and captions. For the musical’s creators, that means finding the emotional sounds of difficult personalities and incidents and making them sing and (occasionally) dance. On Broadway, where it won five Tony Awards (including statues for Kron, Tesori and Gold), Fun Home was performed in the round. Now on its national tour, the production has been reconfigured for proscenium theaters and what it might lose from in-the-round intimacy, it gains in David Zinn’s stunning design, which has a profound moment of deepening the clarity of the storytelling and pulling us deeper into Alison’s experience as she draws closer to the last time she ever spent with her dad. Until that time, the staging is simple. 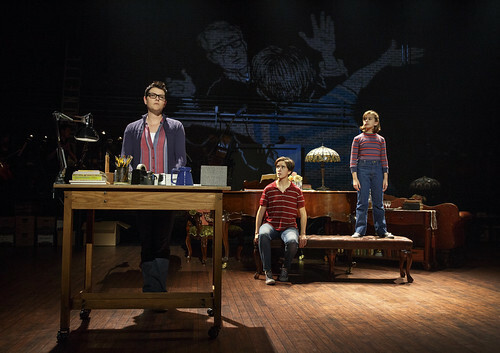 The small orchestra is on a platform at the rear of the stage, and actors move tables and other pieces of furniture around to suggest the family home, the funeral home (known in the family as the “fun home”), a car, Alison’s college dorm room and more. Simplicity turns to escapist flare for two feel-good numbers. The first involves the three young Bechdel children creating their own commercial for the family business (“Come to the Fun Home”) with echoes of the Jackson 5 (especially in the choreography by Danny Mefford) and another with Alison reacting to the rough-edged relationship with her mercurial father by fantasizing a “Partridge Family”-style number to life (“Raincoat of Love”). Tesori’s music for these numbers is infections and joyful and stands in contrast to much of the other music in the show, which feels weighted by dark emotion and uncertainty. It’s not surprising that some moments here evoke Tesori’s brilliant Caroline, or Change in the way they bear the emotional heft of opera but still live in the world of musical theater. Several stand-out numbers include “Ring of Keys,” a startlingly resonant moment in young Alison’s life when she identifies with a butch delivery woman; “Changing My Major,” college-age Alison’s incredibly endearing rush of first love excitement; and “Telephone Wire,” a duet for older Alison and her dad, which says as much in its silences as it does in its music and lyrics. The show ending trio between all three actors who play Alison at various ages, “Flying Away,” is as beautiful and as moving as any musical finale ever. Sometimes musical theater composers forget that when people join voices, it means something, and if there’s a resonant reason for them to be harmonizing the power can be overwhelming. That’s the zone in which Fun Home works. The cast for this Fun Home tour is spectacular. The three actors who play Alison are the show’s heart. Alessandra Baldacchino as young Alison conveys childish enthusiasm confronting the reality of an erratic father, and her performance of “Ring of Keys” is nothing short of thrilling. Kate Shindle as older Alison hovers around the action for much of the play but finally comes into her own in the show’s final numbers. It is irresistible Abby Corrigan as college-age Alison who super-charges the evening. Coming out is such a fraught experience, and she conveys every shadow and spark of the experience with absolute charm and graceful intelligence. Though the story here centers primarily on the enigmatic and troubling Bruce Bechdel, played with utterly believable storm, confusion and steel by Robert Petkoff, his wife, Helen (Susan Moniz), emerges as a fascinating character, a mother who has made some giant compromises and will fiercely protect her children from making the same mistakes. Her song “Days and Days” is shattering. Bruce’s “aria,” “Edges of the World,” captures his conflicts and troubled state of mind in a sad and powerful way. Fun Home began life as an extraordinary work of memoir on the page and has just grown richer in its journey to the stage, with emotional undercurrents bringing depth, beauty and profound reflection to a story of secrets, lies and discovering what it really means to grow up. Fun Home continues through Feb. 19 at the Curran Theatre, 445 Geary St., San Francisco Tickets are $29-$149. Call 415-358-1220 or visit www.sfcurran.com.